Romitaman Original Comic Book Art :: Private Collection :: Amazing Spiderman 1970s Syndicated Newspaper Strip Header Art by artist John Romita Sr.
Click Here To See PUBLISHED Sunday Header Image From Newspaper! Check out VERY "HISTORIC" LARGE drawing (Vellum on board) with various poses of Spider-man by the great John Romita! This is the "HEADER" art for the Spider-man Sunday strips which started out being used in 1977 and are still being used today for the syndicated Amazing Spider-man Comic Strip! 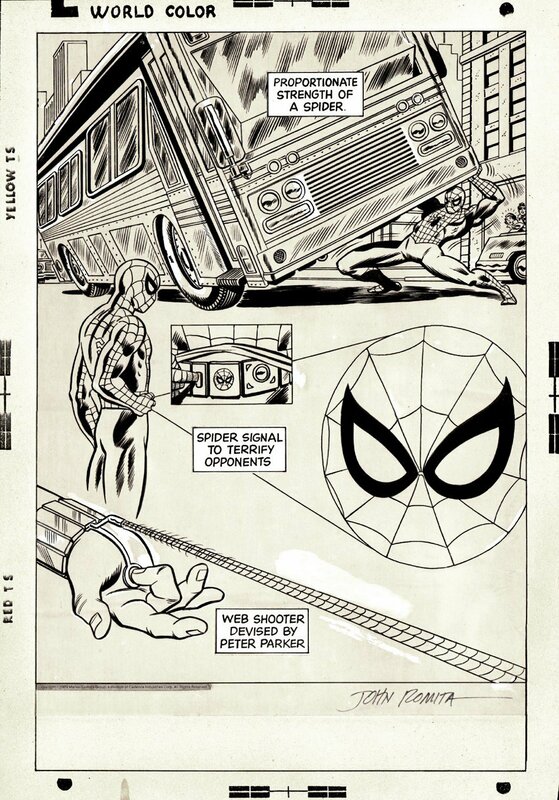 Click the red link above to see a PUBLISHED Amazing Spider-Man Sunday header from early 1978 With Spider-Man lifting the bus! Actual drawn art image measures 11.3 by 16 inches on a 13 by 18.75 inch art board. ALL HIGH end pieces of art, including this one, are able to be purchased with VERY fair time payment plan options, and trades are always considered towards this and "ANY" art on our website! Just send us an email to mikeburkey@aol.com and we can try to work something out.